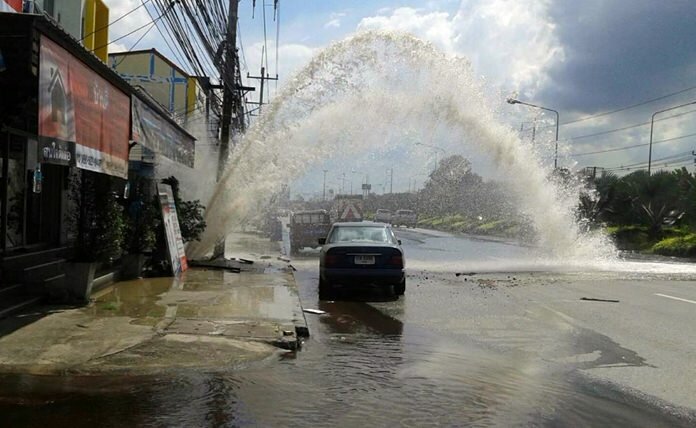 A careless contractor caused a geyser to shoot into the sky on Sukhumvit Road after drilling punctured a water main. Crew foreman Teerapong Chanasut, 35, said he was hired to lay a new water pipe to a commercial building at Soi Banglamung 9 when workers drilled through the main distribution pipe. The result was a towering water geyser that flooded Sukhumvit and brought traffic to a halt Nov. 22. Workers quickly informed the Provincial Waterworks Authority and scrambled to plug the leak and pump out the flooded area.